Independence of Representation in Court and Judicial Accountability in the United States: Did the 9th Circuit, together with U.S. Supreme Court Justice Ginsburg and a party in litigation, fix the case Washington v Trump? Did the 9th Circuit, together with U.S. Supreme Court Justice Ginsburg and a party in litigation, fix the case Washington v Trump? Since last Thursday, February 9, 2017, when the 9th Circuit made its unanimous decision denying the stay of the temporary restraining order (TRO) imposed upon the President's #ExecutiveOrder on immigration by the U.S. District Court for the District of Washington James Robart (a former pro bono lawyer for refugees), I've read a lot of statements in social networks and in the press, in different languages about the decision, and a lot of them were of praise and admiration. Praise to the country which has "the rule of law". Praise to the situation where the President is "not above the law", and where the "court of law" can "show" the President - a lot of impolite words were used as to what exactly the 9th Circuit has "showed" President Trump, but the main polite words were - that the 9th Circuit has "shown" the President of the United States that "he is not above the law" in his actions. And, a lot of Facebook legal experts appeared immediately who taught anybody who would disagree with the legality of the 9th Circuit decision (my analysis of that decision is coming next after this blog) that the 9th Circuit decision is now "the rule of law" and that anybody who is against that decision is an idiot. Well, at least the public has started to pay attention, even vicariously, through attention to the President and what he is doing, to the doings of the nations federal courts, and what those courts are doing. But, before I even engage in legal analysis, I would like to discuss an entirely different matter - conflicts of interest of the 9th Circuit judges that are clear in sight, but which the courageous press that has a lot to say about what the President's wife and daughter are doing, but is surprisingly, or maybe not surprisingly, mum as to the egregious conflicts of interest of judges or appearance of corruption involved in judicial decisions. Judges interpret the same clear text in a variety of different ways. The same set of facts presented in lawsuits against President Trump, resulted in a well-reasoned decision denying the TRO - from a federal court in Massachusetts, and in a long and also reasoned (I would not say well-reasoned) decision denying the stay of a TRO in the 9th Circuit, and attempting to overrule the Massachusetts court, for which the 9th Circuit had no power whatsoever (because the federal court in Massachusetts answered to a different appellate court, the 1st Circuit). But first and foremost, judges should be impartial and should have no personal interest in the outcome of the matter. and when the judge has a personal interest in a case when he is paid out of the fines he imposes in that case - Tumey v. Ohio 273 U.S. 510 (1927). What is also interesting is that when President Trump criticized judges (Judge Curiel in 2016 and judges presiding over immigration cases brought against him in 2017), he was rolled into asphalt by the media and a lot of commentators on Facebook, to the point that the American Bar Association jumped into the fray and claimed that criticizing judges (which the ABA President called "personal attacks") is somehow an assault upon the U.S. Constitution. Nevertheless, in 2012, when the previous president, Barack Obama, criticized judges, the press attacked the judge who allegedly retaliated for that criticism, and not the President for "assaulting the U.S. Constitution" by criticizing judges. In 2010, Barack Obama criticized the U.S. Supreme Court's "Citizen United" ruling as a politically motivated decision, and in 2014, Barack Obama again criticized the U.S. Supreme Court's decision regarding the Obamacare, before the U.S. Supreme Court made a decision regarding that case, while the case is pending. And, while President Trump is not a lawyer, former President Obama has a law degree, and knew that there are rules of lawyers that frown upon lawyer's comments of a case before the court made the decision. And the curtsy was the recognition by the former President - and present lawyer - Barak Obama that "the Supreme Court is /sic/ the final say on our Constitution and our laws, and all of us have to respect it". First of all, it is not clear where the lawyer Barack Obama got the idea that the U.S. Supreme Court DOES have "a final say" "on our Constitution and our laws". The U.S. Constitution that the lawyer and former President Obama was sworn to enforce and protect, says nothing of the kind, its Supremacy Clause does not include precedents of federal courts. Nevertheless, President Obama was not subjected to criticism by the press for criticizing the court deciding his case, and making comments on the case while it was pending. Maybe because President Obama was so well loved by the certain press that, instead of being attacked with criticism by the press, the press actually invited President Obama to a luncheon, after his criticism of judges, and to elicit more criticism out of him, while President Trump is so hated by the press that supported Hillary Clinton that the press cannot bring itself to engage in honest investigative journalism regarding his court case, even regarding facts that are out in the open and do require much time, or resources to investigate. Now, some more boring staff about the exciting "rule of law" that people are so eagerly discussing in the press and on Facebook as total experts - saying that the 9th Circuit has "shown" the President of the United States Donald Trump a lot of things, including that same "rule of law", and that he is not "above the law". access to court means access to an impartial judge or judges, and to an impartial judicial review by a "neutral and detached" - under the Due Process Clause of the 14th Amendment, and the U.S. Supreme Court precedent Ward v. Village of Monroeville, 409 U.S. 57 (1972) ""it certainly violates the Fourteenth Amendment, and deprives a defendant in a criminal case of due process of law, to subject his liberty or property to the judgment of a court the judge of which has a direct, personal, substantial, pecuniary interest in reaching a conclusion against him in his case", citing to Tumey v Ohio, above. Additionally, there are rules of judicial conduct, and, in federal law applicable to the 9th Circuit federal court, a statute, governing judicial disqualification, 28 U.S.C. 455, providing additional statutory prohibitions for judges to serve. Even though a judge's law clerks are not included into the texts of any decisions or statutes, their financial interests very obviously will disqualify the judge, too, since law clerks nowadays play an essential role in judicial decision-making. And, according to Williams v Pennsylvania (above) decided by the U.S. Supreme Court in June of 2016, just several short months ago, even if just one judge was disqualified out of a panel of judges making the decision, the decision is still void as tainted by deliberations with that disqualified judge and by that disqualified judge's input into those deliberations. So, the 3 judges of the 9th Circuit panel, unanimously recognized "proprietary interests" of state universities in the entire country. Is there a problem with such a determination? One of the panel judges, Judge Richard Clifton and his THREE current law clerks not only appear to be joined at the hip with the State University School of Law of the State of Hawaii, but so does the entire 9th Circuit court - and, unfortunately, also the U.S. Supreme Court, and below I will provide references to public documents and portions of such public documents proving it. The interesting fact is that these documents are in open access on the Internet, but the anti-Trump press was not looking that way, and the American Bar Association was afraid to look that way when they sided with the judges rather that with the President of the United States, who was sued on behalf of all of us, taxpayers, and who grievously suffered, as did we all, and our national security, at the hands of a disqualified judicial panel. You know, Hawaii is a good resort location to "exchange ideas", "share insight", "teach" and "be taught" about judicial excellence and all of that. I would also, at the very start of my story about the 9th Circuit's interesting involvement with the state university law school in Hawaii (and then ruling in favor of "proprietary interests" of state universities nationwide, including the Hawaii public university, finding standing where no self-respecting legal scholars would), point out another interesting coincidence - and, since the President indicated a desire to have the case go up to the U.S. Supreme Court, that little "coincidence" definitely matters to the public, and I am filing a series Freedom of Information law requests with various custodians of records to verify details regarding that "coincidence". On January 30, 2017, the Hawaian State University School of Law published a picture and story of how Hawaiian University art students, with the donation from a law firm (Trecker & Fritz), painted a happy flowery 168-foot "mural" in order conceal a supposed eyesore - construction on the school grounds. Good job, Hawaii State University Art Students. Good job, the generous law firm Trecker & Fritz. And, the mural was completed just in time for the visit to the sunny Hawaii of the very busy U.S. Supreme Court Judge Ruth Bader Ginsburg. (while the 9th Circuit decided the case in favor of "proprietary interests" of all state universities, including the Hawaii State University, on February 10, 2017, and the decision was made by Judge Clifton, who practically resides in Hawaii State University Law School, and whose three present clerks are professors in that court). Ruth Ginsburg has so many cases filed with her court that she has no time to review them, rejects the overwhelming majority of them, and pushes the rest of them to be "screened" and sorted out, if not outright decided, by her law clerks, youngsters fresh out of law school - and traveled, during time when the U.S. Supreme Court is not on vacation and must be in session, reviewing cases - to a resort location. By the way, one of Judge Clifton's recent law clerk's, Kamaile A. N. Turcan, is the current law clerk of Judge Ginsburg liberal colleague on the U.S. Supreme Court, who votes in unison with Judge Ginsburg, and vice versa, Judge Sonya Sotomayor. By the way, the just interlinked article about Kamaile A. N. Turcan indicated that it was Judge Clifton who introduced her to Justice Sotomayor in the first place - so he knew that justice personally to begin with, and likely knows Judge Ginsburg, Sotomayor's friend. So, good luck to the President for his right of a fair and impartial judicial review with these two judges from the U.S. Supreme Court. Actually, good luck to the President as to the fair and impartial review of the overwhelming majority of the U.S. Supreme Court Justices deciding this particular case. I recently posted a large blog about how Russian judges were ferried by the American Bar Association across the United States to pave the way of American lawyers into the good graces of the judiciary of Russia, and to promote interests of their clients. Just a year ago, Ginsburg's friend, U.S. Supreme Court judge Antonin Scalia died under still unknown (and extremely suspicious) circumstances, during a Valentine Day's weekend at a remote resort next to Mexican border where he was "visiting" without his wife and mother of his 9 children, where he was invited, according to reports, by a recent party or attorney for that party in whose favor he ruled in a case. After Scalia's death, public debate surged for some time about impropriety of judges accepting freebie trips from attorneys and parties appearing in front of them. Yet, in Washington v Trump case, the debate should start to rage with new force - and I do not see it. Judge (I WILL NOT call her a "justice", since it will do violence to the meaning of that word) Ginsburg knew that the President's case has a high likelihood to land on her desk. Judge Ginsburg knew that the states raise issues of "proprietary standing" of public universities. And yet, Judge Ginsburg considered it possible, during work time, and likely at the expense of the inviting party, to visit a public university in a resort location whose "proprietary interest" she will likely soon be reviewing in court. To me as a citizen and taxpayer, that looks as an outright bribe. Moreover, this is not the first trip of Judge Ginsburg to this particular law school. 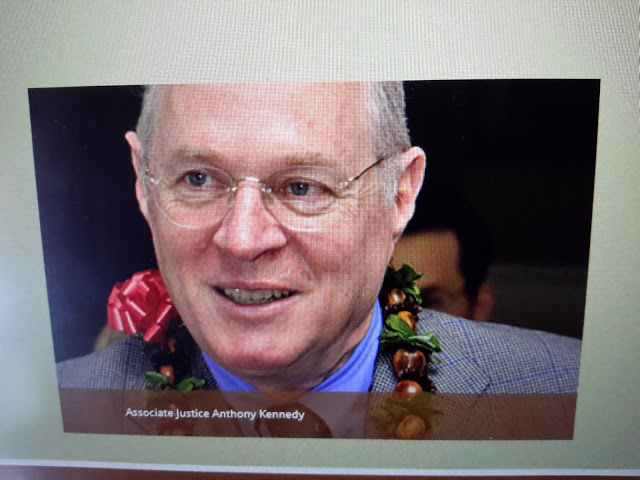 The Hawaiian University School of Law has a "program", "sponsored" by a local large law firm - I am currently verifying the financial details of the deal through freedom of information request - called "U.S. Supreme Court Jurists-in-Residence Program". As part of that program, 5 out of the 8 currently sitting judges of the #USSupremeCourt were ferried to Hawaii at the expense of lawyers, to a public law school in a resort location, to "share their wisdom", many of them not once, Judge Ginsburg showed up there with her husband, so, since the husband died in 2010, Judge Ginsburg has an emotional connection with Honolulu and with the #HawaiianStateUniversitySchoolofLaw that invited them for a free vacation with, I do not doubt, posh accommodations, on the ocean in Hawaii. The last picture is from the law firm "sponsor"'s website of the "U.S. Supreme Court Jurist-in-Residence" program. Case, Lombardi & Pettit got their return on "sponsorship" by getting to host a U.S. Supreme Court justice and her husband at their office and talk to them - discussing cases? Ruth Ginsburg with husband and the Case, Lombardi & Pettit's founding partner (deceased this past summer) Daniel Case. 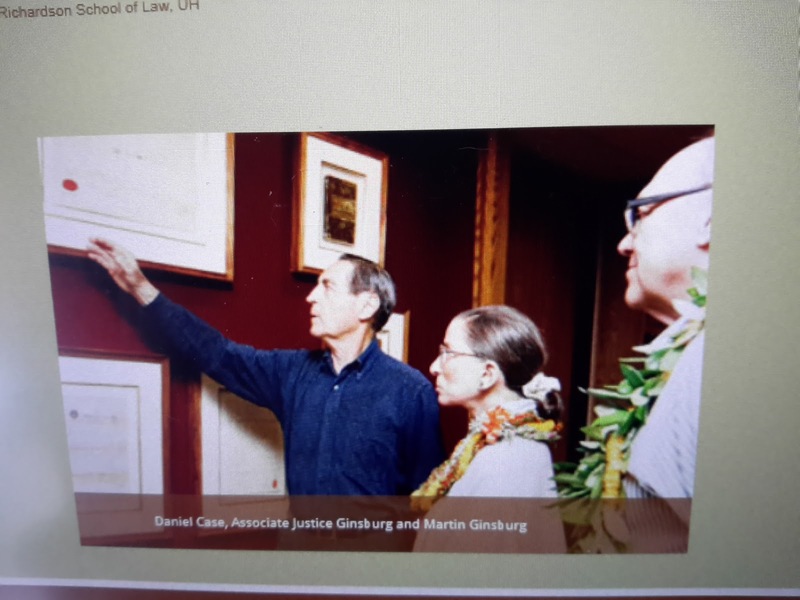 Ruth Ginsburg also just visited the Hawaii University School of Law in 2017, during the time when the case Washington v Trump was orally argued and decided by the 9th Circuit by a judge whose three law present time law clerks - Joshua Korr, Wayne Wagner and Aaron Henson - were, and still are, professors of the Hawaiian State University School of Law, and thus have a personal financial interest in the outcome of Washington v Trump. Only 3 of the currently sitting Supreme Court justices, a minority - Chief Judge John Roberts, Clarence Thomas and Elena Kagan - so far escaped the enticement of a free trip to Hawaii at the expense of a public law school and a local law firm that is "sponsoring" the trips (the extent of "sponsorship" and financing travel expenses and accommodations of judges and their families will be revealed in answers to freedom of information requests). By the way, President Trump's nominee Neil Gorsuch was a law clerk to a now-deceased U.S. Supreme Court Justice Byron White who also took advantage of this freebie, having visited as a "U.S. Supreme Court Jurist in residence" in 1992. 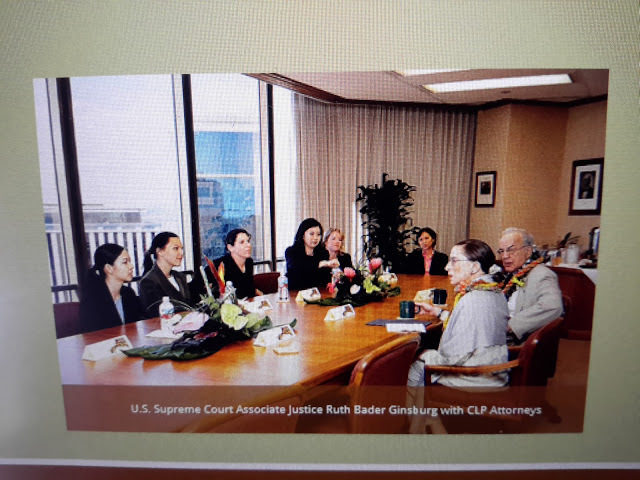 I wonder whether judge Ruth Ginsburg, together with the Hawaiian State University School of Law, a party with a "proprietary interest" in litigation, actually teamed up with these three law clerks of Judge Clifton during her trip to the Hawaiian School of Law on February 8, 2017, to give them instructions how to decide the case, meeting with them under the guise of meeting with the "faculty" of the Hawaiian Law School - a great disguise for an ex parte communication in order to fix a court case. After all, Judge Ginsburg's never tried to conceal her dislike of President Trump and even pledged to emigrate if President Trump was elected, even though she showed no hurry to deliver on her promise.. Instead of emigrating though, she apparently decided that a better use (or abuse) of her power is in in order - helping anybody who is opposing Trump. In any event, whether Ruth Ginsburg was or was not involved in fixing the court case of the 9th Circuit by meeting with Judge Clifton's three law clerks under the guise of meeting with faculty of the Hawaiian State University School of Law - where Judge Clifton's three law clerks are law professors - it is a huge appearance of impropriety for a judge who, knowing that a case regarding a public university will come to her desk, accepts a free trip to from a public university located in a resort location, and especially from one with which she is connected with emotional reminiscences of trips with her late husband. And, it is very apparent that the Hawaii University School of Law had large expectations from this visit of Judge Ginsburg, and had it for a long time (questioning whether Washington v Trump case was pre-planned and staged by the states in collusion with "liberal" judiciary), otherwise they would not be erecting a 168-foot Potemkin village (sorry, "mural"), and having its students happily painting it, to be completed, and happily announced, "coincidentally", right before Judge Ginsburg's visit - apparently, all efforts were made so that nothing at all would displease Judge Ginsburg. As to Judge Ginsburg, she has a long history of using her power to elevate people based on her personal likes (and, obviously, dislikes). 2) second, in helping Lisa S. Blatt to win in 32 cases out of 33, thus elevating Lisa S. Blatt to the so-called "Echo Chamber" (one of 75 lawyers with most cases litigated and won in front of the U.S. Supreme Court), and the only female litigator who has such a "distinguished" record of "victories" in the U.S. Supreme Court - and helping Lisa S. Blatt immensely to gain lucrative teaching positions, in addition to her litigation, as professor of law in top law schools. is what her mentor and friend Judge Ginsburg taught her. And, since Lisa S. Blatt's "whole point, the only point, is to win", and her credo is not to "think about what the law should be or what the law is", only about how to win, it would not be beyond Lisa S. Blatt to use her influence and personal connection with Judge Ginsburg in order to win, not on the law, but because of Ginsburg's personal predisposition to her. The question also emerges as to how broad is this practice, to exercise "discretion" to take 70 cases out of 8,000 filed a year of those who are former U.S. Supreme Court law clerks, or who provide to judges (and their spouses) other favors - like free trips to resorts - when the same people, again and again, "win" cases in front of the U.S. Supreme Court, as Reuters described back in 2014, while judges, including Judge Ginsburg, do not have time to even look at petitions of everybody else, sending them to their "cert pools" of clerks. Same as Ginsburg is dedicated in using her powers as the U.S. Supreme Court justice to steer victories and success towards those she likes, Ginsburg, apparently is active in creating defeats for those - like President Donald Trump - who she publicly dislikes, in favor of parties in litigation (like the State University Law School of Hawaii in whose favor, among other state universities in the country, the 9th Circuit decided the case on February 9, 2017, during Judge Ginsburg's "visit" to the Hawaii School of Law and, likely, meetings with the "faculty", including Judge Clifton's three current law clerks - while the law school was located within 7 minutes' drive from Judge Clifton's chambers). Even without Ginsburg's apparent interference by visit to the state university school of law where Judge Clifton's three law clerks taught as professors at the time the decision was prepared by those same law clerks, the conflict of interest of Judge Clifton himself and his law clerks, and of the 9th Circuit in relation to the Hawaii State University School of Law is staggering. Judge Richard Clifton's personal involvement with the Hawaii State University School of Law. The decision of the 9th Circuit in Washington v Trump clearly gave standing to the States because of "proprietary interest" specifically of state universities across the country, and refused to stay the TRO applied nationwide. That means that ALL states and ALL state universities are parties and class members in the class lawsuit Washington v Trump. Nevertheless, not only Judge Richard Clifton has been, without disclosure of the conflict of interest to Donald Trump and other parties and their counsel, an adjunct professor in the Hawaii University School of Law, but he is a constant fixture in that school, "coaching" law students for moot court competitions, presiding over "panels" and participating in "programs". Just put Judge Richard Clifton's name into the search window at the law school's website, and you will see 10 pages worth of links with discussion of his personal involvement in the life of that public university. 2) should have recused himself, or allowed parties to make motions to recuse based on that disclosure - which has not been done, I have checked the docket report from the case on Pacer.gov. Moreover, Judge Richard Clifton had to know that his 3 law clerks worked in the Hawaii University School of Law as professors, which was disqualifying Judge Richard Clifton from considering "proprietary standing" of that school, as part of all state universities, in the action Washington v Trump. As I mentioned above, the Hawaii State University School of Law parades on its website that they have, as law lecturers, Judge Clifton's three present law clerks, Joshua Korr, Wayne Wagner and Aaron Henson. both in the Hawaii University School of Law as a professor, and in his own former law firm Cades Shutte, which cannot be a mere coincidence. 2) that Judge Richard Clifton did not know of the visit of U.S. Supreme Court Justice Ginsburg, a public Trump-hater, to the public university school of law where he is personally and frequently involved, and where his three law clerks are part of the faculty. That Judge Clifton's three law clerks are professors, and especially paid professors, in a state public university while they are helping their judge decide a case in favor of that university's "proprietary interest", is bad enough, and is already enough to disqualify Judge Clifton from the case - and to void the February 9, 2017 decision in Washington v Trump because of such undisclosed disqualification. What is much worse is that, through actions of his law clerks and the law school, which Judge Clifton cannot claim he was unaware of, Judge Clifton has sent a clear message that the 9th Circuit not only SIDES with public state universities, but that it that the 9th Circuit and a state public university IS ONE AND THE SAME body. Using Judge Clifton's chambers' e-mail addresses of law clerks as contact information of one of the parties in a nationwide class lawsuit also sends a message that the state university in question identifies with the 9th Circuit court, and vice versa, that these two entities have merged and are one and the same - which is disqualifying not only Judge Clifton, but the entire 9th Circuit from this case. Unfortunately, there is more to the disqualification. The Hawaii State University School of Law announced on its website of the existence of an organization called "The Ninth Circuit Pacific Islands Committee", collaborating with another organization called "The Pacific Judicial Council" "an organization made up of judicial officers from a number of island nations". to New Zealand, of all places, no, not for a runaway trip, of course, but allegedly to "participate in the biannual conference" "chaired by the chief justice of New Zealand". "the Ninth Circuit contracted with the University of Hawaii's Richardson School of Law" - the word used is "contracting". So, what did the 9th Circuit contract with the current party in litigation for? It contracted "to organize and conduct the third Pacific Islands Legal Institute for island judges not having prior legal training". But nevertheless, a reason for complete disqualification of the entire 9th Circuit in deciding any cases involving its own contractor. 9th Circuit Senior Judge J. Clifford Wallace - who did not only "served as chair and/or member of the committee from 2000 to 2007", but who also "helped secure nearly $500,000 in annual grants" - I wonder by what means - which "ma[d]e these educational programs possible". Then, the 9th Circuit hires, as a contractor, an entity which is now a party in nationwide highly contentious class litigation against the President of the United States bringing to the court world publicity - and praise. the 9th Circuit presides over a case where it has multiple and multi-faceted personal and financial disqualifying involvements of its multiple judges and clerks - without any disclosure to the parties or attorneys for parties in litigation, and - surprise! - decides the case in favor of its own contractor and employer of one of the presiding judge's 3 law clerks. There is nothing to be happy about. It is not that the principled and independent 9th Circuit has shown the President that he is not above the law. It is that a corrupt court has shown the President how things are usually done in courts, up to the very top of the mountain, and that - unless he cuts this Gordian knot by "draining the swamp" and pushing court reforms, it will continue to be that way. Because now even the U.S. Supreme Court, the MAJORITY of its "justices" are tainted by freebie trips to a party in litigation - and this blog was about just ONE state university that offered freebie "programs" for U.S. Supreme Court justices, there may be much, much more. and, last but not least, by deregulation of the legal profession, at least to the point of removing control over it from the judiciary branch (occupational licensing of all other professions in the U.S. is handled by the executive branch of the government), to eliminate the current situation that even the President's lawyers are in the grip of fear and are unable to present a motion to recuse based on multiple disqualifying conflicts of interest in this case which are "hidden in plain sight". Now that judicial corruption, in full swing, has reached even the President as a party in litigation, it is time to deal it a serious blow. Please, Mr. President, as you promised - drain this swamp, too. PS: I have filed a freedom of information request for certain records with the Hawaii State University School of Law, published it here, and will publish responses to it on this blog.